Lettered in cursive script: Designed by Gilbert & Drawn by F. Skill & W. Walker/London 4th June 1862 Published by W. Walker & Son 64 Margaret Street Cavendish Square/Engraved by W. Walker & G. Zobel./Printed by T. Brooker. The NPG impression is lettered in pencil on the mount: one of the first 20 taken from the plate. the autographs printed from a separate plate. Wm Walker. 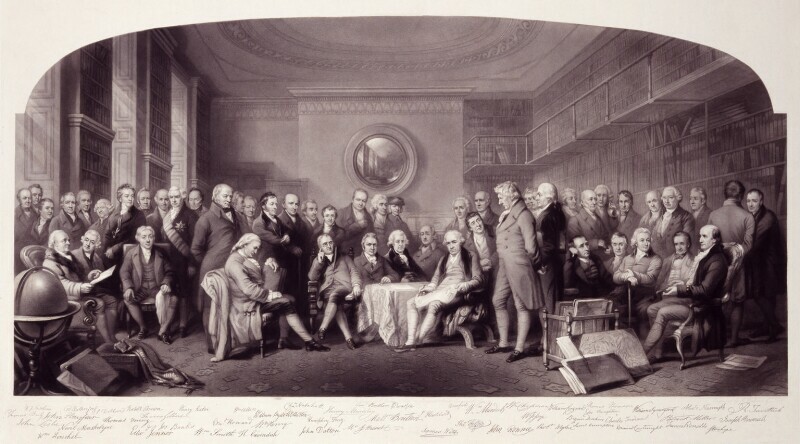 The print was published in 1862 and on sale at three different prices, the prospectus describing it as: 'A Great Historical Engraving in the Best Style of Stipple and Mezzotinto, representing by Fifty most Authentic Portraits, The Distinguished Men of Science of Great Britain, Living in A.D. 1807/8, Assembled in the Library of the Royal Institution.' Impressions are in the British Museum, the Science Museum, the Royal Institution, the Royal Society and elsewhere. The RI impression was presented by Miss Tennant in 1930. Of two impressions in the Royal Society, one without the signatures below was acquired in about 1950, the other with lettering printed in capitals was bequeathed by Miss A. M. Hurst in 1975. Engraving in stipple and mezzotint on paper, containing 51 figures with facsimiles of their signatures, developed from NPG 1075.